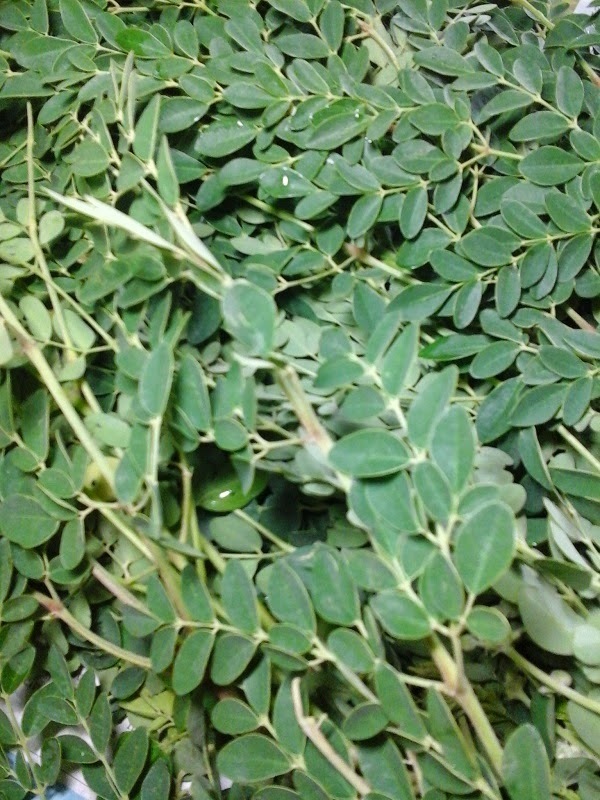 The market is flooded with drumstick leaves since it is the Tamil month Aadi . 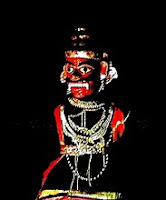 Murungai Keerai Porial is especially prepared on the first day of the Aadi month called Aadi Pandigai and also on Aadi Krithigai day. Rice, Murungai Keerai Porial, Vadai and Payasam are the main dishes prepared and offered to Lord Murugan on the festive occasion of Aadi Krithigai . After completing the Kavadi bearing ritual, the devotees return home to savour this special and nutritious home made meal along with Panchamruta prasadam (a mixture of ripe banana, jaggery, dates, honey, ghee and nuts showered on the image of the Lord as part of the temple pooja) , which is brought back from the temple. 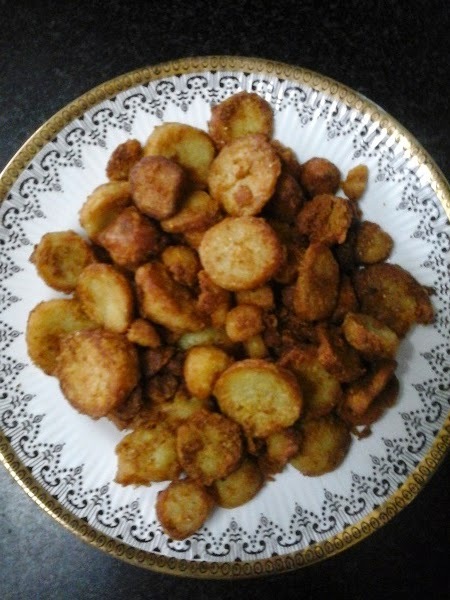 After furnishing me with all the above details my house hold help Gowri shared the customary recipe of Murungai Keerai Porial / Nugge Soppina Palya which was prepared for the occasion. 1. Separate the drumstick leaves from the stalk and wash thoroughly. 2. 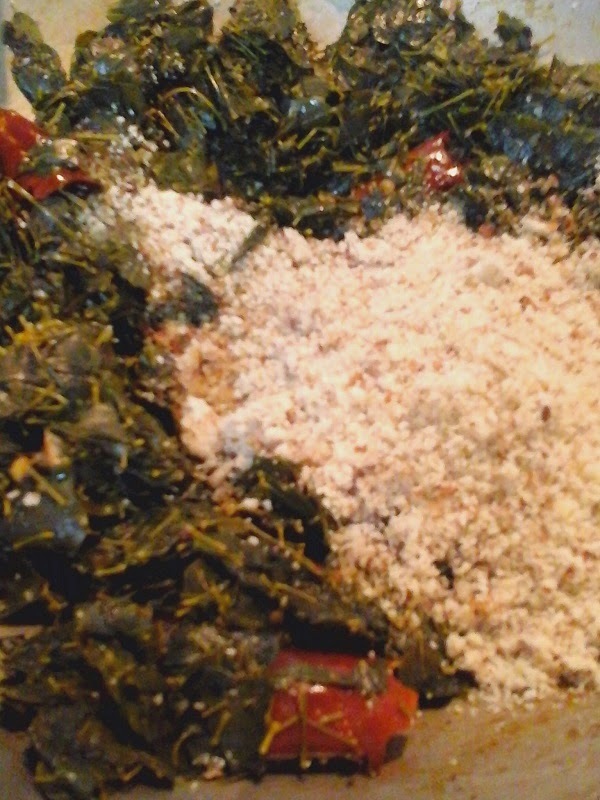 Dry roast the peanuts and grind into a coarse powder and keep aside. 3. Heat ghee and add the mustard seeds. 4. Add the broken red chillies. 5. When the chillies become crisp add the drumstick leaves and stir well. 6. 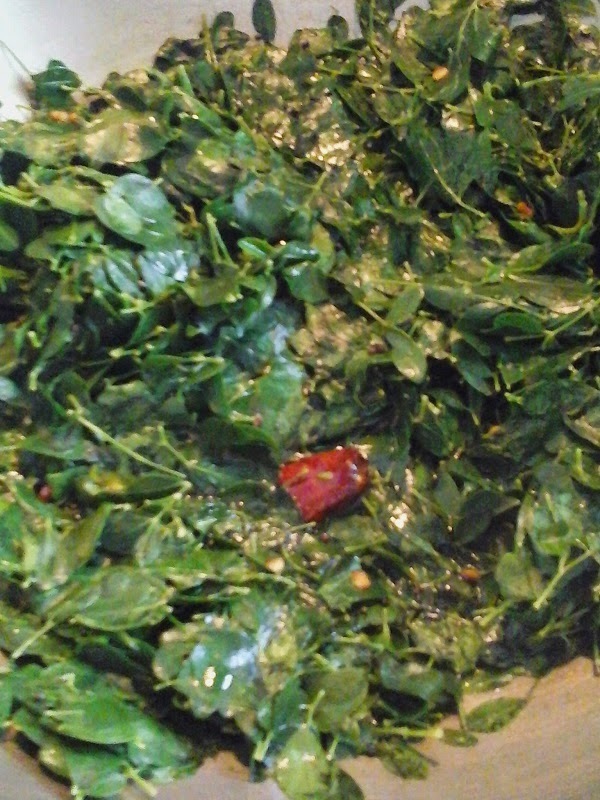 Cover and cook till the leaves wilt. 7. 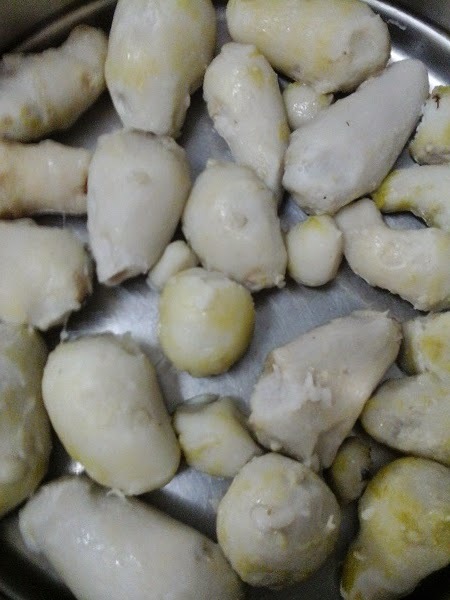 Add salt and the jaggery powder and cook till the leaves become tender. 10. Mix well and switch off flame . 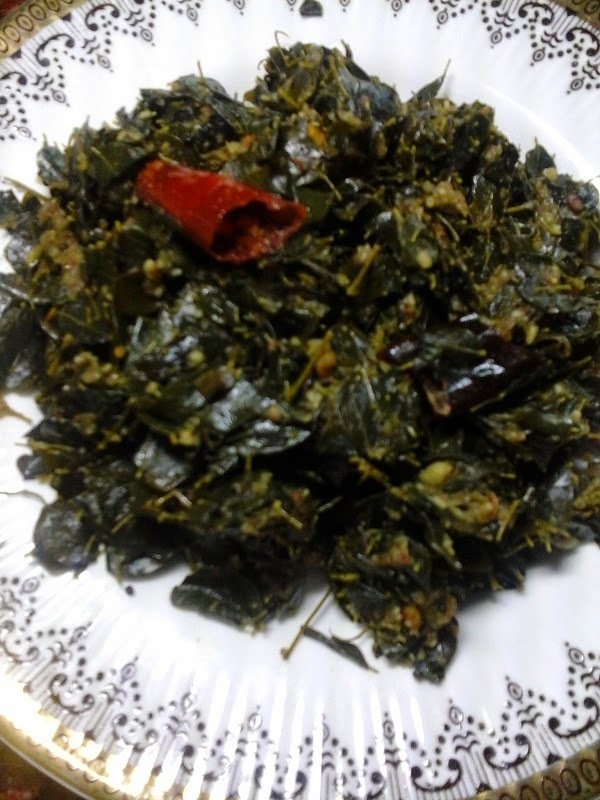 Enjoy the Murungai Keerai Porial / Nugge Soppina Palya bursting with nutrition along with rice or ragi muddae. The simple and flavoursome Goddu rasam / Godsaaru along with rice makes a soothing and light meal. The thin soup can be savoured before a heavy meal . Enjoying the rasam sip by sip is sure to elevate one's spirits on a cold and rainy day ! 1. Soak tamarind in warm water and extract the juice. 2. Add salt, asafoetida, jaggery, turmeric powder and curry leaves to the tamarind extract. 3. Heat 1/2 tsp ghee and roast the split pigeon peas/tur dal till it turns reddish in colour giving out a very pleasant aroma. Add this to the tamarind extract. 4. Boil the above mixture for ten minutes or until the raw smell vanishes. 5. Pour 2 glasses of water into the boiling tamarind extract in a gentle stream so that the rasam is covered with foam . 6. Switch off flame before the rasam boils over. 7. Heat the rest of the ghee and add mustard seeds. 8. When the mustard seeds splutter add the broken red chillies. 9. 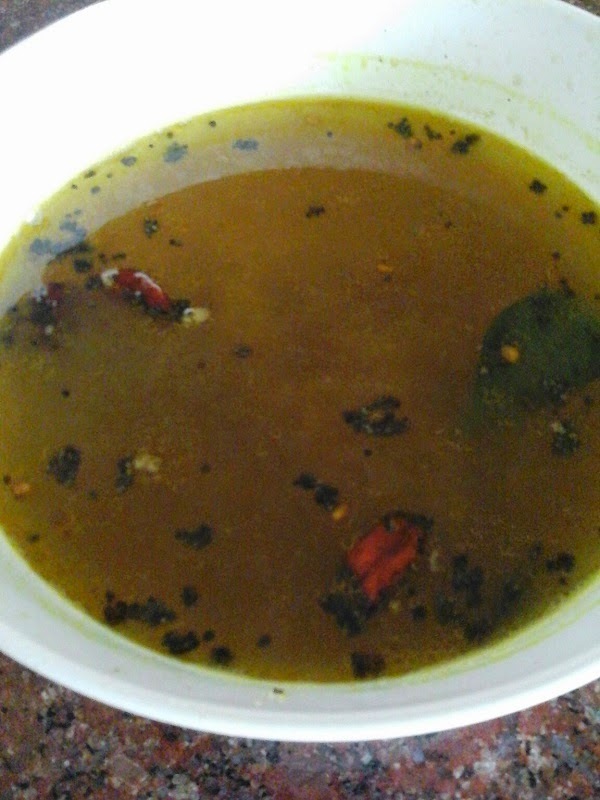 When the chillies become crisp, pour the seasoning over the Goddu Rasam/ Godsaaru. 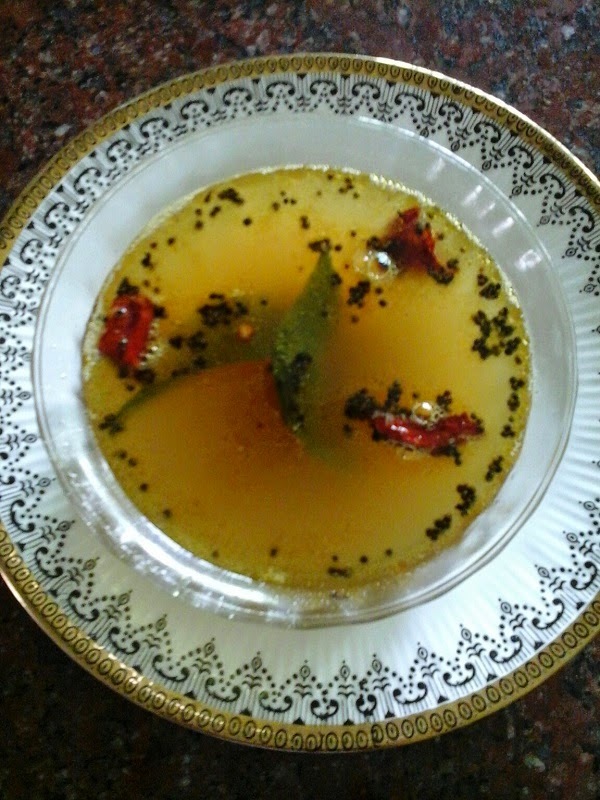 Enjoy the hot and flavoursome Goddu Rasam / Godsaaru with rice and a spoon of ghee. 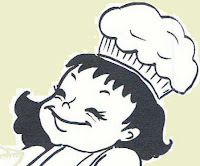 Or enjoy the delicious thin watery soup as it is. My Pati ( grandma ) was not only an excellent cook but was also love and hospitality personified. She was very fond of preparing delicacies for her loved ones even if it demanded a lot of her time and labour.We loved her chips whether banana, potato, senaikizhangu ( elephant yam ) or sepankizhangu ( taro ) which she often prepared for immediate and long term use. She sat on a low stool in front of a kerosene stove placed on the kitchen floor and fried chips in a huge kadai of hot oil for the entire family for very long hours. We ate the fresh and crisp chips as and when they were made till our heart's /stomach's content without letting the huge steel sambadam (steel container) to get filled up . She enjoyed it and continued to fry more and more chips till the sambadam was finally full for future consumption. When I went on my honeymoon 46 years ago , Pati had thrust a huge bag of potato chips into my hands saying that we- especially mapillai (son-in-law)-could munch it during our long drive to the hill station. My husband who was / is a thorough foodie enjoyed the very finely grated potato chips which almost resembled Sev with great appreciation. To this day I lovingly envy my dear Pati because she had stolen my husband's heart even before I did ! 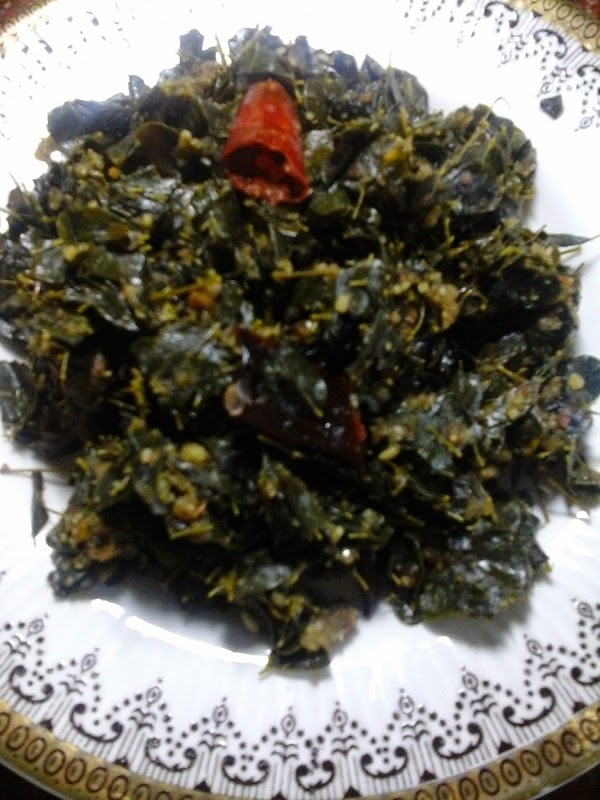 Here is how she prepared Sepankizhangu Varuval which is a festive side dish. But we have never had it with curd rice because we were cautioned that it would cause throat irritation. Take care and enjoy ! 1. 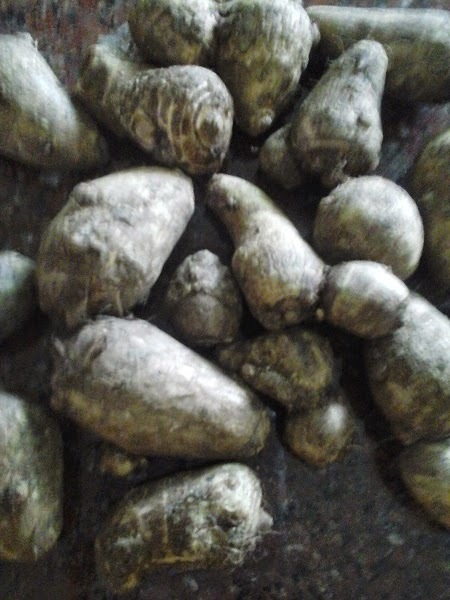 Thoroughly wash Taro, cover with water and boil till the skin loosens. 2. Drain, cool and peel. 3. 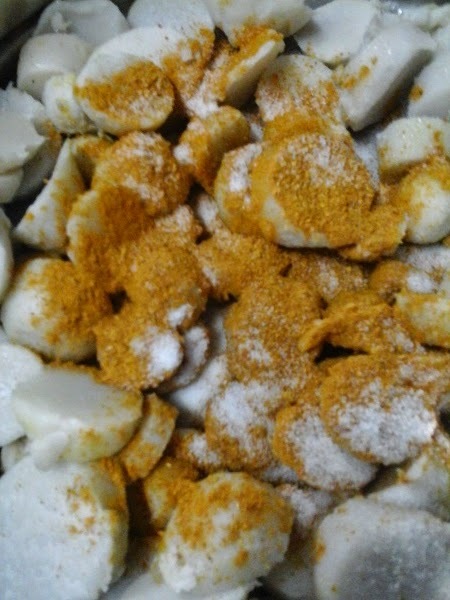 Cut into 3/4 inch slices and mix in sambar powder, salt and asafoetida evenly. 4. Heat oil in a kadai and gently slide a handful of the taro slices into the oil. 5. Turn over using a perforated ladle and fry till the varuval becomes crisp and golden brown in colour. Enjoy the yummy Sepankizhangu Varuval with your sambar rice and rasam rice.